Dorie, whose blog I’ve followed for years, worked on the house with her family and says they bought it from a woman who had lived here since the ’70s. 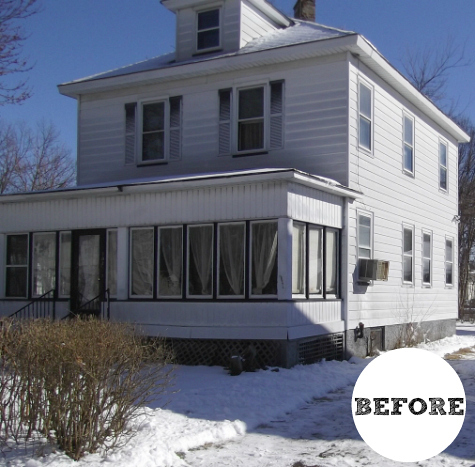 “I knew the second I saw this little house that I wanted to strip the paint off that wood on the front porch and stain it to add some warmth,” Dorie says. They replaced the old wall-to-wall carpeting that had been throughout the house with hardwoods. They knocked down walls between the old dining room and kitchen to create one big space. They used a pretty, patterned Merola Tile on the backsplash. I was really scared to scroll down and see the “after” pics. What a relief to see a reno that pays respect to it’s integrity. Love everything about this, especially the kitchen–that’s how you update and retain original charm. I could move into this home and not change a thing! Love the wood trim outside! And I love how light and airy it is inside now! Beautiful. They killed it! I love everything about this! I want this house so much. It is perfect. Love the time around the bathtub and the front window especially. Love the wall color! Any chance the owners would share the paint info with us? LOVE your site Julia! You can leave her a comment on her blog and ask, but I know she’ll be out of the country and probably won’t be blogging much for the next couple weeks. Wish I could help! Love it! The only thing I wonder about is the giant picture window. Privacy? Pitch perfect! A respectful redo and a great looking house. I really like most of what they did with this house. My only small quibble is that I’m so over grey paint. It makes the interior feel very cold — especially if this house is near the beach there are a lot of grey, foggy days. He stripped the paint off the exterior wood to “warm it up” but then made the interior so icy-looking. But I love Ventura. It’s a cool beach town, though it’s been getting gradually gentrified over the years. I’m sure this little (although I was surprised the sq ft were over 1400 — most of these house are under 1000) house sold for a pretty penny. I love Dorie’s blog and have followed her for years too. I know they uprooted and moved to be near the beach but I always loved what she did in her homes….I keep hoping they will buy another fixer upper for themselves and showcase it soon! I loved almost everything except the kitchen– does every redo have to take down the wall between the kitchen and dining room, and put an island in the kitchen? It just didn’t fit the era of the house for me. however, there is one thing I don’t understand. why oh why in Southern California do people have grass?! grass requires A LOT of water to flourish. also, its boring. of the incredible climate and plants available. 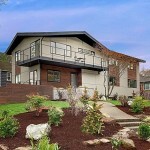 This house is clearly a flip and sod is cheapest to put in and appeals to families. Hopefully, whoever buys it might be interested in putting in more drought tolerant plants. Native landscaping would really make this house pop! This is truly an AH-dorable little cottage! Thanks for sharing it with us, Julia! I love the remodel! But such a large refrigerator for so small a house, lol. The mud room/laundry room was a good idea along with the kitchen expansion. Great story. Don’t like the big picture window! Wow! Its amazing what talent can do. I would never in a million years thing stained wood on the outside could look so good. I was suprised and really really liked it. Very nice! Love the black and white tile in the kitchen. Such a cute house. Would be great as a vacation rental. Wow…I did a huge double-take on this house. It looks exactly like the first house we lived in together in New Mexico…we called it “the smallest house in the world”. We even put up lattice (I know, tacky, but we had no money and wanted to enclose the front entry.). The kitchen with tiny stove was also the same. Interesting. Our little rental was only 1 bed/1 bath so it is a lot smaller than this one, but the exact same style….love the finished look…perfect. What great pics! I would love a charming little home like this near the beach. They did a great job remodeling it! The exterior is just perfect now. Love the stained wood and turquoise door. I like the interior too, with just a few reservations – I’m sad that the fireplace tile was changed. It looked original and very lovely. Also the kitchen – I agree with the poster above who wondered why kitchens can’t keep their walls these days. I know the original was tiny, but I would have preferred something with a bit more personality. But I guess if they renovated to sell, most people demand a huge kitchen these days. Nice job overall, though. We have one of these types of houses nearby – kind of incongruous in our east coast neighborhood – but I’d love to see the inside some day. Beautiful remodel! I love that they kept a lot of the original design. I like everything but the kitchen. It’s very remodeled, not vintage at all. Not my cup of tea. The rest is amazing. I live half an hour from this house! Wish I could have watched the metamorphosis in person!